If anything of the new soul begins to glow in a human being, then there is great joy. Such a person has, after all, experienced something of a higher reality, of a grand plan and now knows from within that also for him or her there is a mighty spiritual perspective. However, for those human beings who have been touched in such a special way, the joy is still incidental and certainly not stable. For as soon as a person (symbolized by Elizabeth, Zacharias and John), driven by inner recognition and insight (Mary and Joseph) is longing to let the spiritual being (Jesus) come to development within him or her, it seems as if everyone and everything is trying to prevent it. If the soul begins to awaken within you, you will have the natural tendency to share your joy about this with people who are dear to you, your life partner, relatives and friends. However, it often appears that they do not have any interest in this and switch to everyday topics as soon as possible. Elizabeth knew not that Herod sought to slay her son, and she and John were yet in Bethlehem; but when she knew, she took the infant John and hastened to the hills. The murderous guards were near; they pressed upon her hard; but then she knew the secret caves in all the hills, and into one she ran and hid herself and John until the guards were gone. In a fairy tale by Hans Christian Andersen, the Ugly Duckling is bullied by the young ducks because he is different. He thinks that there is something wrong with him but is not yet aware that he is a swan in the making. But as soon as the swan (symbolizing the soul) has reached maturity, he is free and the ducks no longer bother him. A human being must overcome quite a few resistances on the way to adulthood. However, the resistances on the way to the maturity of the soul are even greater and above all of a different character. Both the personality and the soul need opposition in order to obtain strength. 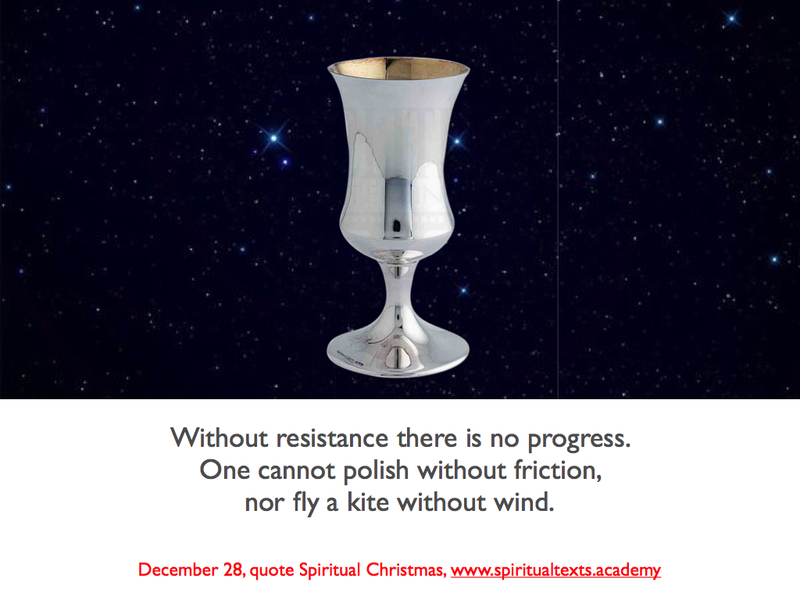 Without resistance there is no progress. One cannot polish without friction, nor fly a kite without wind. In our society there is much that makes it difficult for the Other-one-within-us to awaken, to be active and to grow. Every day our attention is drawn toward the external world by means of a bombardment with stimuli from sight, sound, smell, taste and feelings. The subtle voice of the soul is easily deafened by this. There are forces that prevent human beings from going the Gnostic spiritual path. Why? Because everything in this world has the natural tendency is to maintain the existing equilibrium. Anything that places this equilibrium at risk, will be fought against. It is this primal basis of existence that causes human beings, plants and animals to recover from illnesses and injuries. This principle is the reason why organizations, social systems, cultures, solar systems, et cetera, can remain in existence and why it takes so much effort to change existing situations. This equilibrium-seeking force is an inwardly directed force. When it concerns the individual human being we call this force: ego-centricity. As soon as any human being chooses to suddenly withdraw from that world, he or she will inevitably evoke counterforces. In the Christmas narrative these counterforces are referred to as King Herod. These magian priests could read the hearts of men; they read the wickedness of Herod’s heart, and knew that he had sworn to kill the new born king. And so they told the secret to the parents of the child, and bid them flee beyond the reach of harm. And then the priests went on their homeward way; they went not through Jerusalem. And Joseph took the infant Jesus and his mother in the night and fled to Egypt land, and with Elihu and Salome in ancient Zoan they abode. There is no place for the new soul in this world. There is no room in the inn. In fact, all kinds of powers of this world seek to kill the new soul, the young Jesus. They seek to kill not only the new soul, but also the personality that is paving the way for this soul: John. That is what the story of the massacre of innocent children in The Aquarian Gospel makes clear. Their cruel task was done; the guards returned and told the story to the king. They said, We know that we have slain the infant king; but John his harbinger, we could not find. The king was angry with his guards because they failed to slay the infant John; He sent them to the tower in chains. In the story about the children’s massacre by order of King Herod, not just one child is killed but countless children. The ‘children’s massacre’ has perhaps taken place within ourselves many times, because even the story of this slaughter indicates a spiritual process: the emerging powers of the soul are nipped in the bud through natural resistance to alien forces. So again the character Herod has a symbolic meaning. Herod is the essential force of natural resistance on the spiritual path. This resistance is located both inside and outside of us and can occur in many forms, shapes and situations that we encounter, especially at those times when we least expect it. But it is also the force that the inner life can and must fight in order to be able to rise to a higher plane. If the inner life of the soul is strong enough, then it will overcome the resistance of that moment and be able to proceed. Thus the impediments may turn into milestones on the path that we have to follow. The higher self of man arouses in the lower self the desire to walk a spiritual path. But the lower self on its own does not feel the slightest need to do so because it knows that it will then have to recede into the background. Joseph and Mary, the head and the heart, are informed about what to do from within: to protect the young child and flee into Egypt, the symbol of the state of neutrality and silence of the soul. The soul never fights. At most the soul makes itself known to the personality from within by means of suggestions on how to act. The natural reaction of the personality is to fight the Jesus and John within him. To which voice will he/she listen…..? In this delicate early stage there is only one way to escape the inner and outer violence… by taking flight, that is, by rushing to a place where the threats are much reduced. In practice this means: protecting yourself as much as possible from harmful influences and thereby opening yourself to the whispers of the other life. Joseph and Mary flee to Egypt with their child (Egypt is also the symbol of the Mysteries, the force field of the soul). Along with Elizabeth and John, they have been taught in the mystery schools of Elihu and Salome. They have overcome the resistances; Herod dies. In Zoan the inner Man as well as the personality receive the insight and strength to further devote themselves to their task. That is the great miracle of the Mysteries. This reflexion is so true for me ! At the beginning of my path, my family ejected me and I had to survive from a lot of difficulties. But now, the fidelity to the other-in-me, brings me gifts at each moment and I care about my thoughts, feelings and acts.